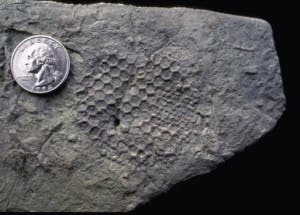 Paleodictyon is a mysterious fossil pattern found mainly in marine sediments thought to be specific of a certain paleo-depth range; it is a relatively widespread trace fossil – called this way because it is mainly accepted that it is created by a burrowing creature. Although it has been discovered since the dawn of geology and fossil hunting, no one was able to find sediments where you can also see the “architect” of such a symmetric creation – given that underwater honeybees are excluded. A new study finds a special type of paleodictyon fossils in the limestone of Nevada and Mexico – one where clues to the elusive pattern may appear to be present. At least that is what the lead author proposes, Mark McMenamin, a paleontologist at Mount Holyoke College in South Hadley, Massachusetts. Besides the fact that this new fossil may hint towards an explanation of a centuries’ old mystery, what is also interesting is the fossil’s age: about 540 million years – placing it in the early Cambrian – a period when modern multicellular life seemed to have emerged and diversified in a relatively brief period of geological time. When examining the fossil, McMenamin noticed that some of the burrow swarms seemed to cut through organic pellets 250 to 500 micrometers in diameter — making the pellets too large to have been created by the creature that made the burrows. “I noticed that the smaller micro-burrows tended to cluster in the center of the swarms,”says McMenamin. The paleontologist hypothesizes that some sort of adult animal laid down the organic pellets to form a nest around its eggs – and if these eggs were mostly made of soft material, which is the case for many animals – they failed to fossilize. “The hatchlings then fed on organic matter in the pellets that had been broken down by bacteria,”he says. 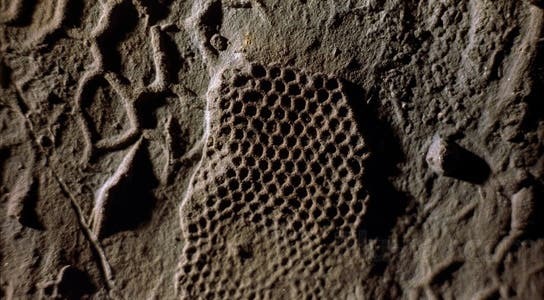 As they “ate their nest”, the hatchlings would have left that hexagonal burrowing pattern that we see fossilized today. Although it all seems amazing, it is hard to irrevocably link such parenting behavior to this type of fossil. Gabriela Mangano, who studies Cambrian burrows at the University of Saskatchewan in Saskatoon, Canada says the idea certainly is spectacular, but for it to be true, it needs to rely on a more detailed morphological analysis. Duncan McIlroy, a burrow specialist at the Memorial University of Newfoundland in St John’s says that in order to bring further evidence, one idea would be to create a 3D model of the rock containing the fossil, perhaps by making a section passing through its regions of interest: “I would look for a discrete structure as part of a large semi-permanent burrow system created by the adult,” he says. A few cases in which paleodictyon would not be related to this type of parenting would be, for example that the creatures making burrows would actually be preying on the hypothesized eggs. Or perhaps the small creatures would have nothing to do with the whole idea of nests and eggs, and it just came and drew it’s mysterious pattern in the sediment, years after such organic pellets existed. After all, what are a few years or even a decade when compared to the vast eons of geologic time ?